The current trend in manufacturing is towards tailor-made products in smaller lots with shorter delivery times. 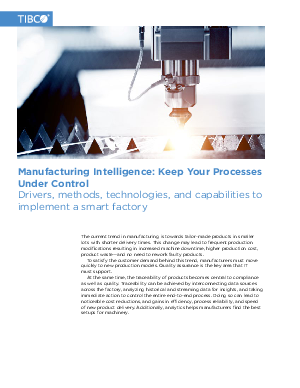 This change may lead to frequent production modifications resulting in increased machine downtime, higher production cost, product waste—and no need to rework faulty products. To satisfy the customer demand behind this trend, manufacturers must move quickly to new production models. Quality assurance is the key area that IT must support. At the same time, the traceability of products becomes central to compliance as well as quality. Traceability can be achieved by interconnecting data sources across the factory, analyzing historical and streaming data for insights, and taking immediate action to control the entire end-to-end process. Doing so can lead to noticeable cost reductions, and gains in efficiency, process reliability, and speed of new product delivery. Additionally, analytics helps manufacturers find the best setups for machinery.